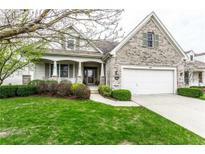 Below you can view all the homes for sale in the Centennial subdivision located in Westfield Indiana. Listings in Centennial are updated daily from data we receive from the Indianapolis multiple listing service. To learn more about any of these homes or to receive custom notifications when a new property is listed for sale in Centennial, give us a call at 480-577-2304. Hurry, this won't last long! MLS#21633422. F.C. Tucker Company. This house is move in ready! MLS#21629885. Keller Williams Indpls Metro N.
Wood blinds throughout and and Brand New faucets in all the Bathrooms! MLS#21630317. CENTURY 21 Scheetz. Chef's Kitchen w/Large Island w/Bar/Staggered Cabnts with pull-Out Shelving & Crown Mldg/Granite/Pantry/Tile Backsplash/Stainless Steel appliances/Breakfast room-Great room Features Wall-of- Windows/Gas Stacked Stone Fireplace-Master Suite with trey Ceiling/Soaking Tub/Tile Shower/2 Sink Vanity/Walk-in & Water Closets-10' Ceilings on Main Level & 9' in the Spacious Finished Basement-Laundry room w/ Window/Sink/Cabinets-Family Entry w/Mail Station-Good Closet Space-Finished Garage w/Pegboard Wall/Door Opener/Attic Access-Open Patio-2" Blinds-Ceiling Fans-Alarm-New Roof & H2O Heater in 2017-Hardwood Laminate & Tile Floors-Great Location! MLS#21628998. F.C. Tucker Company. Two additional bedrooms on second floor. Must see! MLS#21619856. Keller Williams Indpls Metro N.
Mins from shops & restaurants. Community pool, parks & nature areas. MLS#21618351. Keller Williams Indpls Metro N.
Close proximity to Westfield amenities: Monon Trail, Grand Park, Downtown & US31. MLS#21625586. Keller Williams Indpls Metro N.
Huge 3-car, tandem garage great for additional storage, vehicles or work shop. Enjoy the lifestyle. MLS#21625790. Encore Sotheby's International. Beautiful corner lot with adjacent common space and backyard screened in patio overlooking mature trees and apple orchard. MLS#21604336. Cornwell Realty. For more info for community see. www.centennialHOA/Westfield/IN. MLS#21573451. F.C. Tucker Company.